Article first published as Blu-ray Review: Zazie dans le métro — The Criterion Collection on Blogcritics. Louis Malle’s Zazie dans le métro is an exuberant blast of irreverence. Despite its proximity to the French New Wave, it bears almost no resemblance to the movement’s initial films, even if it consciously flouts classical cinematic convention in some related ways. Rather, Zazie most looks like a Tex Avery cartoon come to life, with a nonstop barrage of gags, camera tricks and odd editing that turn 1960s Paris into a colorful and chaotic fantasy world. 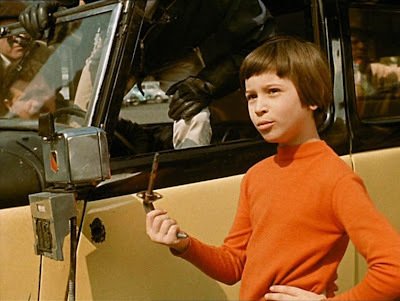 At the center of the chaos is Zazie (Catherine Demongeot), a sardonic and mischievous 10-year-old who gets left with her uncle Gabriel (Philippe Noiret) while her mother goes off on a romantic weekend with her latest squeeze. Uncle has plans to show her the sights, but Zazie is only interested in going underground to ride the metro — an impossibility as the metro workers are on strike. As traffic piles up due to the strike, so do the absurdities. Zazie discovers her uncle is a dancer in a drag show, and she gets chased all over town by him and a disguise-wearing policeman (Vittorio Caprioli). Her misadventures take her all across the city, up the Eiffel Tower and into a flea market where she lusts after a pair of blue jeans. A tomboy with an uneven haircut and a foul mouth, Zazie does little to hide her casual contempt for the adult world surrounding her, and she doesn’t hesitate to falsely accuse adults of unspeakable acts or berate them for what she perceives as stupidity. She makes for the reliably disdainful center of a film that is unreservedly manic and has Malle seemingly throwing stuff up on screen just to see if it’ll work. Much of the time it does, but Zazie’s pace is so frenetic, the comedy almost doesn’t register as such much of the time. It seems like it should be a laugh riot, but its breakneck speed and underlying cynical tone make for a film that’s more admirably nuts than outright funny. There’s certainly no second-guessing Malle’s commitment to outright preposterousness, with the film’s final big set piece — the destruction of a restaurant — embracing its illogicality with fervor. Zazie dans le métro doesn’t ever slow down, wrapping its subversive tendencies in a charming live action cartoon. Zazie dans le métro is presented in 1080p high definition with an aspect ratio of 1.33:1. The film’s bright and cheery color palette is represented strongly, although the film has a slightly yellowish hue. It seems likely this is the intended look, as it remains consistent throughout. Fine detail is pleasingly rendered, particularly in close-ups of faces — often distorted because of the short focus lenses Malle often employed here. Picture sharpness and clarity is strong, while damage remains confined to a few stray marks here and there, with the final reel bearing a sizeable mark at the top of the frame in a few shots. Audio is presented in an uncompressed monaural track that doesn’t suffer from any background hissing or crackling. Voices are clear and consistent, while musical cues possess reasonable fidelity. Lots of archival video interviews are included, and all are a worth a look, even if they’re a bit short. Malle talks about adapting the novel and Charlie Chaplin’s reaction after he screened the film for him. Queneau is featured in two separate interviews, where he’s fairly evasive about his own work, but expresses some admiration for the film. Probably the most entertaining extra is an interview with Demongeot and her parents, where the interviewer seems to be trying to get them to admit Zazie’s bad behavior has negatively affected Demongeot in real life. A newer interview features screenwriter Jean-Paul Rappeneau talking about his involvement, while a Criterion-exclusive audio interview has William Klein talking about being brought on as co-director. He admits that being a co-director is pretty much impossible, and he’s actually credited as artistic consultant. You can certainly see some of Zazie in Klein’s outrageous features, three of which are collected in one of Criterion’s Eclipse sets. A 2005 featurette has assistant director Philippe Collin looking at some of the locations where the film was shot and talking about his involvement in the production. The disc also includes the original theatrical trailer. The package includes a booklet with an essay by scholar Ginette Vincendeau. An all-out-wacky film that should be witnessed at least once, Zazie dans le métro is given excellent treatment here.